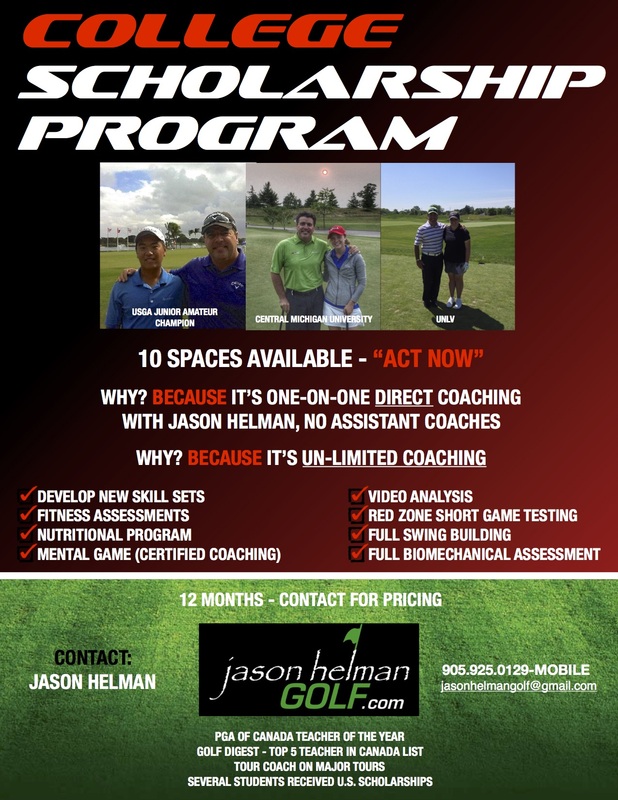 Jason Helman’s Golf Instruction and Golf Coaching Programs in Toronto are outstanding. Jason Helman’s Golf Instruction and Golf Coaching Programs in Toronto are outstanding, he is one of Canada’s best golf coaches. Jason prefers to spend more time playing golf with you and transferring any new skills to the course through his golf coaching programs and learning to actually play golf versus golf swing. Finding the right golf coach is the key to your success in the game. One of Jason’s strongest skills is that he makes sure he listens to the golfer and adapts to the golfer or athlete in front of him. He does not have a one way method that fits all nor does he try and re-invent the wheel or start over with your swing mechanics. If you truly want to have more enjoyment from the game you have to commit to working towards improving your skills, transfer train those skills to the course and learn to perform on the course. Over the course of the past 11 years Jason Helman has been striving to change the paradigm of how golf instruction is presented. Jason does not focus on single lessons or small packages. He believes as in every other sport that students need to commit if they really want to get better and achieve their goals. In every other sport the coach is always with you during practice and the game. However, this isn’t the case with golf. Traditionally, you take a lesson or a series of them and are then expected to be able to do it on the course by yourself. In Jason’s coaching programs he prefers to spend more time playing with you and transferring any new skills to the course and learning to actually play golf versus golf swing. This requires students to have a solid long term relationship with the golf coach and an understanding of what student accountability really means as a golfer or an athlete. Thus, Jason’s golf coaching programs have been very popular and extremely successful. If you want quality coaching from one of the best golf coaches or golf instructor’s in Canada sign up for your golf Coaching Program today! Over the years and years of putting packages together I’ve found it very useful to have a coaching package offered for the golfer who really wants to commit to getting better. If you’ve finished buying the latest driver or newest set of irons each year and you’re still at the same old level and you would like to learn how to actually getting better versus attempting to buy a reduced score/slice or hook then this package is most likely for you. 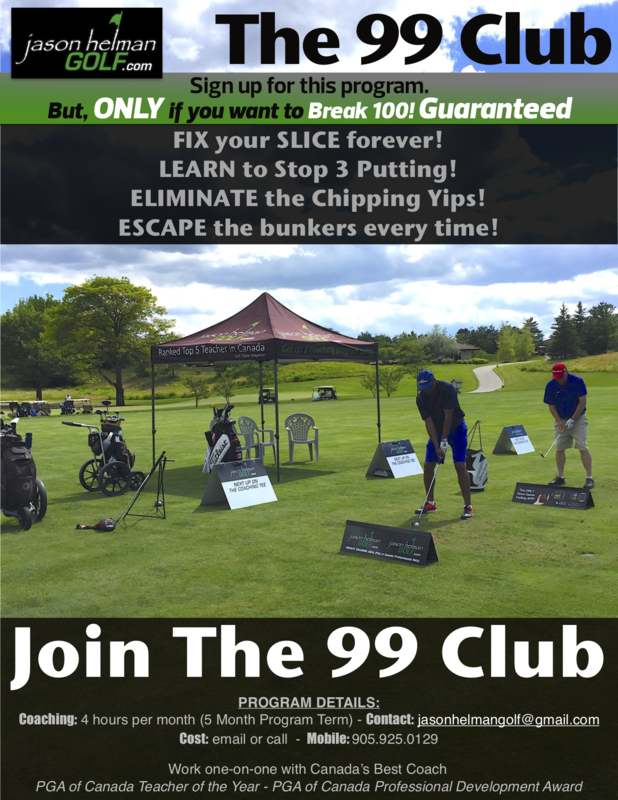 But, this program is ONLY if you want to break 100, GUARANTEED. 4 Hours per month, (5 Month Term) Limited availability, SIGN UP NOW! 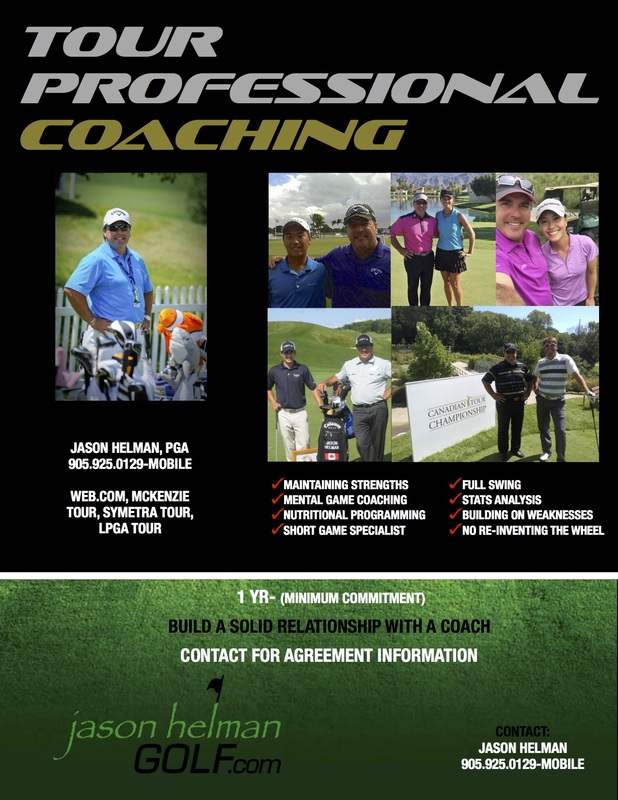 Over the years and years of putting packages together I’ve found it very useful to have a coaching package offered for the golfer who really wants to commit to getting better. If you’ve finished buying the latest driver or newest set of irons each year and you’re still at the same old level and you would like to learn how to actually getting better versus attempting to buy a reduced score/slice or hook then this package is most likely for you. 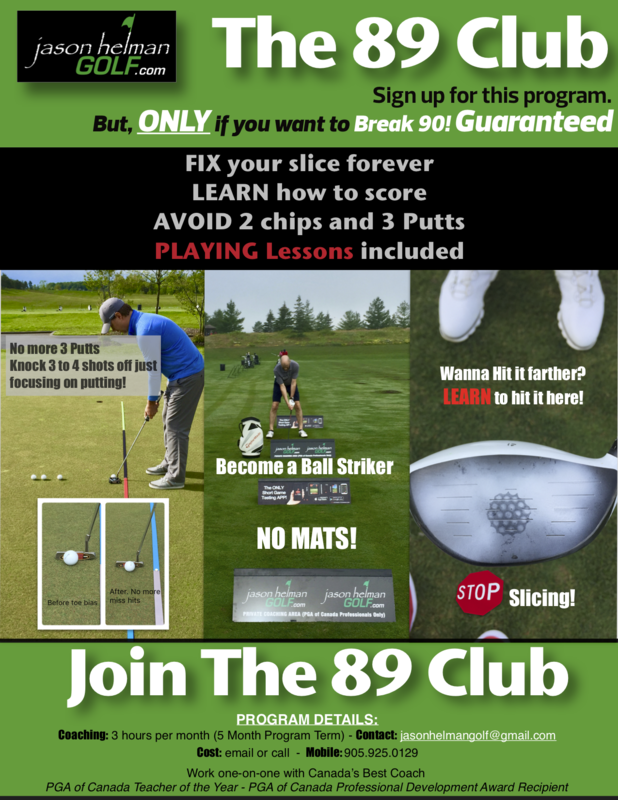 But, ONLY if you want to break 90, GUARANTEED 3 hours per month, (5 Month Term) Limited availability, SIGN UP NOW! Over the years and years of putting packages together I’ve found it very useful to have a coaching package offered for the golfer who really wants to commit to getting better. If you’ve finished buying the latest driver or newest set of irons each year and you’re still at the same old level and you would like to learn how to actually getting better versus attempting to buy a reduced score/slice or hook then this package is most likely for you. 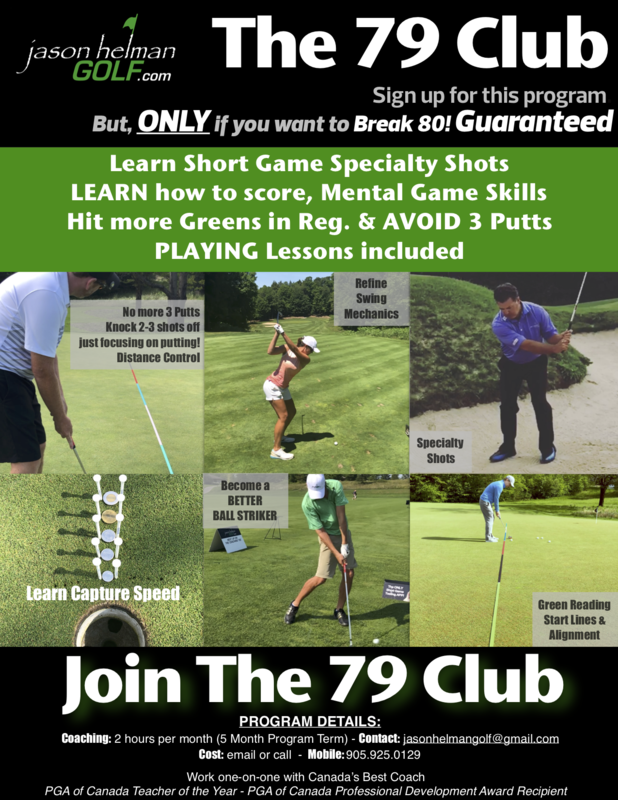 But, ONLY if you want to break 80, GUARANTEED, 2 hours per month, (5 Month Term) Limited availability, SIGN UP NOW! Spend 3 hours in a group of no more than 3 or one on one with Jason Helman using video, the Zepp sensor and other technology to diagnose and immediately prescribe a plan to improve your body movement patterns and ultimately the club and ball movements/shape. Tighten your shot dispersion, improve your impact, and make your swing feel as smooth as the pros make it look. This is a 12 month program. UN-LIMITED COACHING. This program requires commitment, dedication, passion and perseverance. The individual will meet Jason Helman and schedule sessions 48 hours in advance. Sessions might be with on Sports Psychology, Nutrition or Fitness. Students will spend instructional time with Director of Instruction Jason Helman only and work one-on-one both on the range and on the golf course. The following will be used to facilitate the findings: SAM Balance Lab 3D Analysis, SAM PuttLab, Private online Training Space for Videos and Drills, Video Analysis, Launch Monitors, and other fitness related testing to ensure you reach the highest level possible, these are inclusive to the program. The components of this program consist of monthly coaching sessions, supervised practices, nutritional sessions, fitness sessions, mental game coaching, Other notable topics: goal setting, tournament scheduling College Resume and recruiting information. CALL – EMAIL for Pricing (10 SPACES AVAILABLE) – Act Now! NOTICE: Be creative! Show some initiative versus copying and pasting someones else’s hard work. Please note all programs have been created by Jason Helman Golf, all professionals are subject to national and zone by-laws. Plagiarism of any programs will not be tolerated and any violations will be submitted to the appropriate office for disciplinary measures. The Playing Lesson is kind of like the most under used shot in golf. We understand that there’s sometimes an easier shot and we weigh the outcome in our heads but ultimately we can sometimes pick the wrong shot simply because it might look better if we pull it off. So, when it comes to coaching or other aspects of learning we determine what is the best option in order for me to learn? Do I learn and build my skills on the range? Not a bad choice, do you do that for the rest of your life and keep beating balls like driving a long straight monotonous road for hundreds of miles? Maybe players should invest in themselves like they diversify their portfolio. Maybe take a little of this and a little of that from each sector. If your coach doesn’t offer that, it may be time to re-evaluate why you’re not learning or developing. Try mixing in a playing lesson with your coach and learn in the environment in which you actually play and expect results. The practice area is for you to build your skills and confidence in order to develop a repeatable pattern. There’s lots of great range players, but if you can’t produce and perform at game time it can be very frustrating. Invest in your game by investing in yourself. 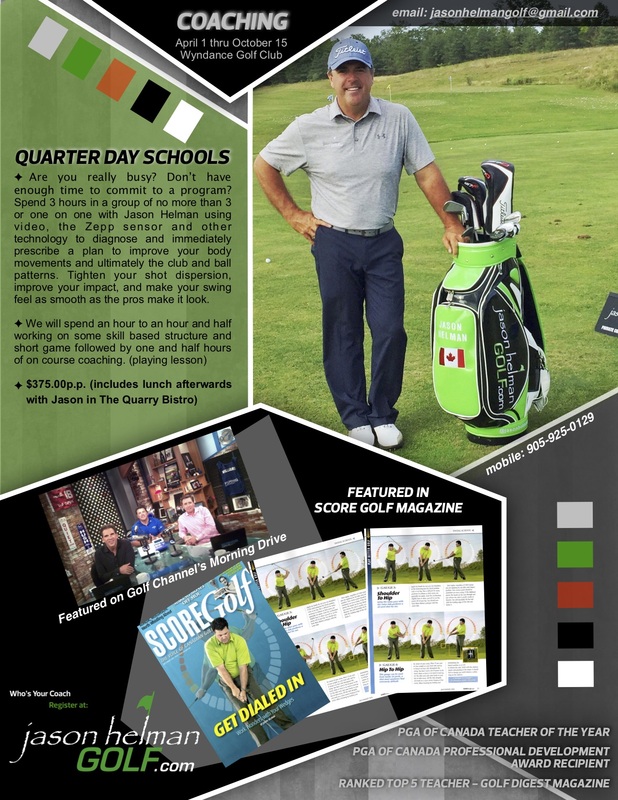 Jason Helman is a two time PGA of Canada National Award winner receiving the coveted PGA of Canada Teacher of the Year & PGA of Canada Professional Development Award. Jason is available for any type of corporate outing from speaking engagements, corporate event awards presentations, corporate instructional clinics, learning programs for your corporate tournament or contest participation during your outing. He is very personable and your guests will enjoy their time spent with him in whatever situation you wish to contract him. Don’t miss out on your chance today to sign up one of Canada’s best golf coaches for your special event. The following is a daily rate schedule excluding any travel expenses. Please email him at jasonhelmangolf@gmail.com or contact him at 905-925-0129 for more information. Jason will play with a featured group for the day and also present a clinic for all participants prior to the round on the range.